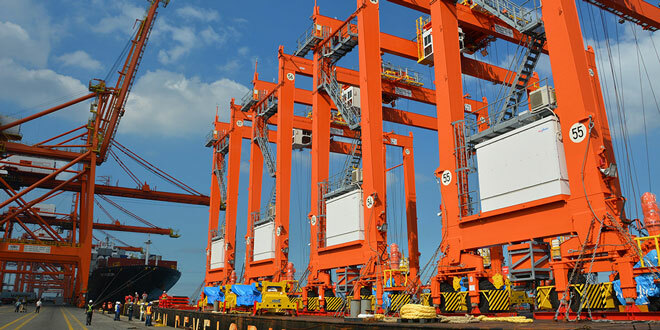 International Container Terminal Services, Inc.’s (ICTSI) flagship Manila International Container Terminal (MICT) recently received four of 16 new hybrid rubber-tired gantries (RTG) as part of the Company’s long-term investment in capacity enhancement and environmental efficiency. A first in the country and Manufactured by Mitsui Engineering & Shipbuilding Co. Ltd. (MES) of Japan, the Mitsui Li-ion Hybrid RTG is equipped with a 200kVA Li-ion battery and a smaller diesel engine that dramatically improves the carbon footprint of the terminal. Once fully commissioned, the hybrid RTGs are expected to further boost MICT’s container yard productivity, and allow the country’s largest, best-equipped and most technologically-advanced container terminal to fully match demand in terms of operational performance. The new port equipment also underscore ICTSI’s Group-wide commitment towards ensuring an environment-friendly supply chain—among which, includes expanding the use of next generation energy-efficient cargo handling equipment and vehicle fleets. Seen to reduce carbon emissions by 40 percent and noise levels at the container yard, and up to 60 percent better fuel economy—these hybrids reaffirm the Company’s efforts in minimizing the impact of port operations at its Manila flagship. “As we continuously drive economic growth in our home operations, ICTSI will always be at the forefront of innovation with ports equipment and adaptive technology that ensures increasing productivity while reducing carbon footprint,” says Christian R. Gonzalez, ICTSI Global Corporate Head. Two super post-Panamax quay cranes and twelve more hybrid RTGs are arriving before the end of the first half of 2019. Three QCs delivered in 2018, including the first pair of neo-Panamax cranes in the country,are already operational. Capacity improvements are also underway at the Manila flagship, among which includes the first phase construction of Berths 7 and 8, and back-up areas for the future Berths 9 and 10. The MICT is certified with ISO 14001:2008, fully-compliant with the local environmental laws, and has systems to strictly monitor and manage its stack emissions, water usage and effluent, and waste generation.